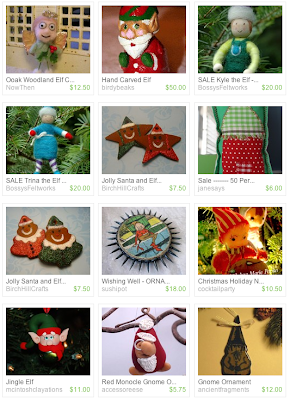 The Funky Felter: It is a Christmas Elf Friday! Have a great weekend! It is a Christmas Elf Friday! Have a great weekend! It has taken me a long time to get into the holiday spirit this year. I must confess that we don't even have our Christmas tree up yet! We plan to put it up this weekend. It has just been so busy around my house that I have put off just about everything holiday related. I have managed to do some shopping on Etsy though and have purchased quite a few things for presents by now. In order to be more festive, I thought that I'd post some cutie pie elves on my blog today. I found these while searching for "Christmas Elf Ornaments" on Etsy. They all make me smile! I hope that they make you smile too on this TGIF! Have a great weekend! Hi! Thanks for leaving a comment on my blog. Guess what, I think we were both in that fibers class at Maple Woods a few years ago. I recognize you from your picture. I still do some felting too. Did you get a chance to come out to the creative hand sale?